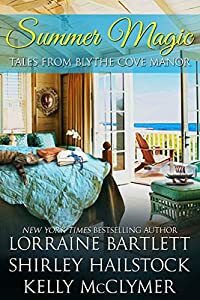 Sweet Dreams by Lorraine Bartlett: Serious life changes have pushed Paige and Alex Campbell to the brink of divorce. Still, they win a weekend at lovely Blythe Cove Manor and experience vivid dreams. Is there a chance this magical place inspires the nighttime fantasies that could help them fall in love again? Forever Bound by Shirley Hailstock: You never know what you'll find when you pull down a wall. But Eleanora Sloan was unprepared for the mahogany box and its unusual contents as she worked on her home in Tennessee. And she never thought it would lead her to Blythe Cove Manor on Martha's Vineyard. Honeymoon with a Ghost by Kelly McClymer: Wedding planners know that no wedding goes off without a hitch, but most don't expect the groom to vanish hours after the wedding. Emily Stevens heads for her honeymoon suite in Blythe Cover Manor alone, determined to find out who her husband really was.